Dionysus (also called Bacchus) is the well-known god of grapes. What’s not so well-known about Dionysus is that he had a tough time fitting in with the other gods. His mother was a mortal and his father was Zeus, king of the gods, which made him a foreigner wherever he went. In many respects, Midwestern wine is like Dionysus, something of an outcast but also historically significant. Midwestern grape growers and winemakers are an important part of wine history, but other wine regions get most of the glory. In this article, we will briefly explore the global contributions of Midwest wine and explain why the Midwest is moving up in the pantheon of wine regions. It’s not much of a stretch to say that Midwesterners saved the French wine industry. In the later 1800’s, an invasive aphid called phylloxera ravaged French vineyards. The future of French wine was in jeopardy until George Hussman, a Missouri grape grower, came to the rescue. The pests that afflicted the French vineyards occur naturally in Midwestern soil, so native Midwestern grapes have a natural immunity. Hussman and his grape grower friends from Missouri shipped 17 carloads of phylloxera resistant U.S. rootstock to France. The French grafted the Missouri roots onto their vines and a grape crisis was averted. Where is The First Commercial Vineyard in the U.S.? You might have guessed the first commercial vineyard in the U.S. was on the East Coast or in California. 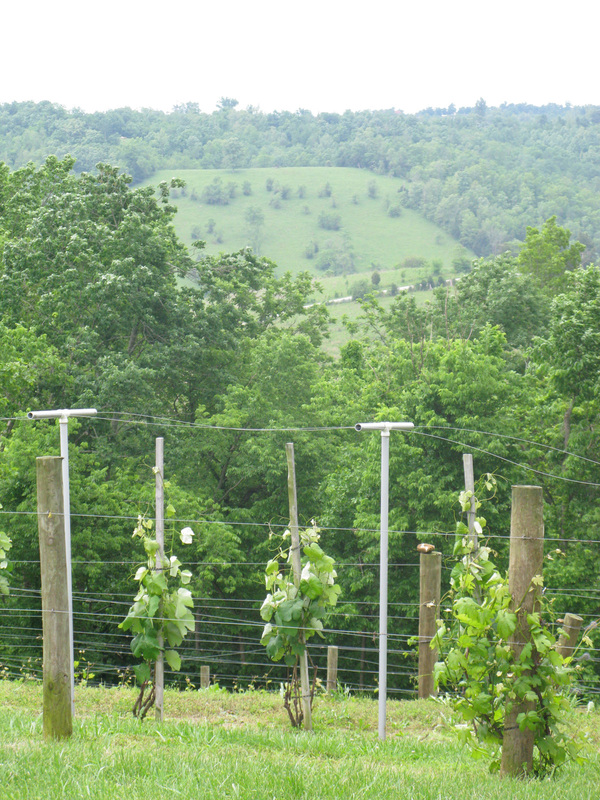 In reality, the first commercial vineyard is in Kentucky, south of Lexington. In 1798, John James Dufour immigrated from Switzerland to Kentucky with a business plan to grow wine grapes in the central U.S. Dufour bought a property on the Kentucky river which had been surveyed by Daniel Boone. Several “founding fathers,” like Henry Clay, took part in Dufour’s project. Thomas Jefferson even received bottles of Dufour’s wine while in the White House and commented on its quality. 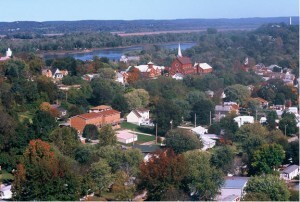 Dufour’s winemaking operation lasted several years before he moved to a new location on the Ohio River in Vevay, Indiana. In Indiana, Dufour gave up on trying to grow European grapes and had much better success. Today, you can visit wineries at the same locations where Dufour helped start American viticulture. 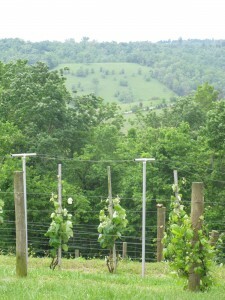 The First Vineyard has a tasting room on the site of Dufour’s original vineyard and The Ridge Winery in Vevay, Indiana is a popular attraction. Today, there are 60,000 acres of grapes growing in Sonoma County, California, the largest licensed American Viticultural Area. But Sonoma County was not a well know wine producing region until a Wisconsinite from Hungary started planting European grapes there. Around 1850, Hungarian Count Agoston Haraszthy started a vineyard at the current site of Wollersheim Winery in Sauk City, Wisconsin. Haraszthy amassed a small fortune in Wisconsin and used much of his wealth to start the modern wine and grape industry in Sonoma County. Planting old world wine grapes in Northern California might sound like a no-brainer, but Harasthy was the first one to do it successfully on a larger scale. Today, you can visit historic Wollersheim Winery in Sauk City, Wisconsin and go inside the Count’s refurbished 150 year old wine cave. 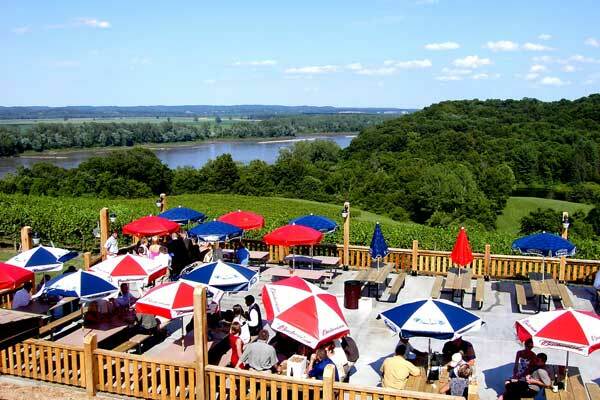 Wollersheim was named one of the Top 10 Winery Tours in the U.S. by TripAdvisor and is on the National Historic Register. The Midwest is a nexus of cold climate wine grape breeding. The University of Minnesota – along with Cornell University in New York- is regarded as one of the top hybrid grape breeding programs in the United States. Grapes are not the only fruit to come from the University of Minnesota. Ever had a Honeycrisp or SweeTango apple? These popular apples were developed in Minnesota, as were many varieties of cold hardy plums, strawberries and blueberries. The University of Minnesota grape breeding program under the direction of Jim Luby and Peter Hemstad have developed five wine grapes including Marquette and La Crescent. Thousand of acres of these grapes are now growing in the Midwest, the Northeast, as well as Canada and the Pacific Northwest. The largest winery between the Finger Lakes and California is located in Bloomington, Indiana. Bill Oliver took over Oliver Winery from his father in 1983 when the winery was primarily a mead (honey) wine producer. Today, the winery produces an estimated 800,000 gallons of wine each year and attracts hundreds of thousands of visitors a year. Oliver also grows 60 acres of hybrid and vinifera grapes in Southern Indiana. Traverse City, Michigan has the largest concentration of wineries in the Midwest (about 40 and counting.) Traverse City has become a national tourist destination and is internationally recognized for the wines produced on the Leelanau and Old Mission Peninsulas. During April 2014, Travel and Leisure magazine ranked the Leelanau Peninsula Wine Trail as one of America’s Most Scenic Waterside Drives. The only wine made from a native American grape is the state grape of Missouri. Norton wine started in Virginia, but Missouri is the top producer of this inky, dry red wine that is increasing in popularity. Despite these impressive accomplishments, what makes Midwest wine truly special are hundreds of small, family owned wineries you can visit. As more winemakers and grape growers apply their skills, the Midwest wine industry continues to be an innovator in the global wine industry.